Friday, October 30, 1998 - Submit News! I'll be out of town for the entire weekend (off in the NetJet? ;), visiting some friends at Central Michigan University, so there probably won't be any updates until Monday or so (unless Blitz or Nigel make an update here or there). Feel free to send in your news, and I'll try to get it all up sometime Monday. Thanks! Quake Innovations has released a special "Halloween Edition" of their Ultimate Paintball mod. This special edition includes a themed map, sounds, and also a Paintball PumpkinBot. The PumpkinBot works with the team that shot it last, and will help out by throwing paintballs at the enemy. Pretty cool ;) Screenshots and other info can be found at their site. A nifty little log-extracting program called DemoLog has been released. This utility extracts .log's out of Quake2 demos without having to start up Q2 to view the demos themselves. For more info and for the downloads, check that page (note: it's totally in spanish, give Babelfish a try). The Barry's World CTF Site is looking for CTF demos, specifically of people defending a flag carrier. If you have one that you'd like to submit, you can email it to them here. The Bodyshop is looking for CTF skins to be submitted for inclusion in their upcoming VwepPak+ release. If you have any, please email them to Krull. The Croation QuakeArena Scene has changed hosts, be sure to update your bookmarks. Thursday, October 29, 1998 - Submit News! Richard Hess over at SGIQuake has released a beta port that he's done of Ridah's Eraser Bot for the SGI. This release is very stable but still called a beta because of a problem with handling route files (.rt3) that have been previously generated on intel machines. This will be fixed in the next version. Version 1.1 of Chaos Deathmatch has been released. Also, keep your eyes peeled for a stand-alone version of the Havoc Bot (currently only available bundled with Chaos DM) that's coming soon! v1.11 fixes some minor bugs in v1.1 and comes with a new grappling hook. BarrysWorld has released a transparent DLL that plugs right into any existing mod and provides ZBot detection. Features include: ZBot detection and kicking with option to log offenders IP, Rate capping (really helps to reduce lag on busy servers! ), Player IP and NAME banning, Player server admin capababilites, and configurable weapon / item spawning. They have released versions for both Windows and Linux, so if you admin a server, be sure to check it out! 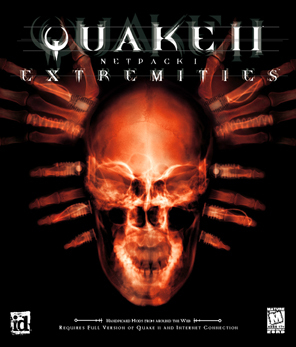 Win a copy of "Quake II Internet Pack No. 1: Extremities" from Mod Central! Do you like mods? I mean, do you REALLLY like mods? Can you prove it? How about for a copy of id's new Quake II Internet Pack No. 1: Extremities? I thought so! I'm very happy to announce that courtesy of id Software, Mod Central will be giving away one free copy of id's upcoming Extremities mod compilation pack to the person who can prove themself more mod-happy than anyone else! "What do I have to do! ", you say? The rules are simple: send in an email listing every Quake II mod you can find, along with the homepage for the mod. In two weeks, the entry with the most mods correctly listed will be announced as the winner! (Check the official contest page for full details.) Thanks again to id Software for being the coolest company on the planet - get those emails rolling! Q2Gamma, the "Quake2 Image Enhancement Utility" has been released. If you're into the tweaking and image quality aspect you might be interested in this release, so be sure to check it out. Final entries for the Impulse Map Making Competition are due in, as the competition closes in one week. The top 3 entries will be used in Quake2 Duel matches at Impulse 98. The winner will also receive a Diamond Monster Fusion 2D/3D combo 16MB Video Card and 32MB of SDRAM. If you're a coder or graphics artist, and are interested in helping out upstart mods, drop Alex a note for more info on joining his "1Way CTF" team. Quake Server Control is nearing completion and the team is looking for people to help them test this really cool utility. The UrbanCTF team is in "serious need" of one or two weapon model skinners to help them out as they draw closer to the release of their mod. This site is offering a free port on a fast server to clans that are interested, drop by for more details. There's an aftermath recap of one of Ireland's biggest LAN-fest's ever, with over 144 people in attendance! Pels Interactive has undergone a redesign. Tuesday, October 27, 1998 - Submit News! I'd just like to say goodbye to one of the best people that I've ever had a chance to work with - LadyICE. She's been an invaluable addition to staff, and she will be sorely missed by myself, and the rest of us here at Quake2.com. I want to wish her the best in whatever she goes on to do in the future. I'm sure she'll make us all proud to have worked with her (heck, we already are!). Everyone be sure to send Lady some mail and tell her what a great job she's done. See ya on the flipside, Lady. Just wanted to drop a line that we're nearing the final packaging design for Extremities. Activision has been very supportive of our efforts and Focus2 has created some of the coolest designs for this compilation. Extremities will introduce many people to the works of some very talented authors. We hope this cooperative effort will be the first in a line of products that increases public awareness of the Quake online community. We've gotten great responses from the mod authors. Each of the chosen authors will be receiving royalties in addition to the well deserved credit for their great efforts. We are all looking forward to the release of Extremities. * CTF will be included with the latest patch update of Quake II. She also sent along the box art for the release, you can view it here. The *FINAL* version of Keys2 has been released. This version (1.93) was required to be compatible with Quake2 v3.20's new shell rendering stuffs. The Sparc Solaris version is available now, with the Solaris x86 version coming soon. The Generations Quake2 team has released version 0.93 of their way cool combo "id tribute" mod. This version includes more bug fixes, including the class menu bug, and also is packed with more maps! Spinoza has released four new maps for his Battle of the Sexes mod. Three of them are by Kevorkian (eek) and one is by heXum. To provide some assistance to girlz who have entered the OGL for the first time under the Q2 Female 1 on 1 Ladder, GameGirlz has started a discussion group for this on the GG public forums. We invite anyone who is taking part in this ladder (or who is thinking about it) and organizers of the OGL to stop by, post Q&A, provide any information you can to girlz, and also use it as a possible venue for working out details of your matches. The Jungle Team is looking for mappers, drop by their site for more info. Quake 2 Invite Capture Ring 4 has started up and is looking for HTML & graphics help, refs, servers, and more to help them get up and running. If you live in the Liverpool, England area and are interested in attending a get together and helping out with a LAN party, email Necro for more info. TheNet is back up and in working shape, and is still providing webpage design services to just about any 3D gaming related site. The Belgian online gaming network "Fragland" has moved to their own domain over at Fragland.net. Monday, October 26, 1998 - Submit News! Sluggo over at Mod Central has been busy...he has a new weekly feature called the Monday Morning Interview, and this week, he interviews Paolo "Nusco" Perrotta and Roberto "TaZ" Bettazzoni, the creators of Holy Wars. He gets the guys to touch on subjects like their recent 2.1 release, what they see in Holy War's future (including the possibilty of a HW3), their advice to other mod makers, and a few other subjects. I read it, and I say "don't miss this one!" Looking for some sites dedicated to that new 3D game you read about? Or how about sites for your current favorite? You can find a new search engine to help you find what you're looking for on the new Stroggos 3D Game Archive. Sunday, October 25, 1998 - Submit News! Ward Six Entertainment has released three new screenshots from their upcoming commercial total conversion, Dawn of Darkness. You can see the newest screenshots, as well as screenshots of the characters and objects in the DoD Gallery. Q2FE 3.0 SR1 Final has been released to fix a minor bug with the master servers. Q2FE (Quake2 Front End) is a program which enables Quake2 server administrators to configure their server fast and easily without having to remember pages of Flag settings or commands. You can read the FAQ and get the download here at the Q2FE website. HMS:RiGoRmOrTiS, a UK Quake2 site dedicated to Q2 demos and pics, is looking for your demo submissions. Stop by their site for info on submitting demos and pics. WebDog v0.50, which will take the place of the QBS2 tracker, has finally been released and is available for download from www.webdog.org. This version is required by ALL QBS2 users and is available in both upgrade and full installation formats. The QBS2 tracker will be switched off in a couple of weeks time and will no longer be updated with new sites, so if you wish to continue to receive update notifications, you will need this new version. The new Webdog tracker is now fully functional with both .plans and news pages, and has a whole array of new features and bug fixes compared to the last version of QBS2. Saturday, October 24, 1998 - Submit News! Intelligent ingame camera with 5 cam-modes. You can download Chaos DM here, but if you wish to skip the large download, and have the patience to wait...you will find Chaos DeathMatch v1.1 on the upcoming iDSoftware release of the Internet Pack "Extremities". GibStats II Ver 2.4 RTS has been released and is available from the GibStats II website. This new release features RTS (Real Time Stats), which brings a new dimension to Quake2 stats. You can now display the scores of players of an ongoing match as a table or graph, and spectators and players can follow the course of a match at all times and have results instantly. For full details, visit the GibStats website. The United Quake Servers Administration team have signed up Shane "Killerbee" Powell, who has released his Zbot Detector v0.94 to the UQSA for redistribution. This server side mod, named UQSA Zbot Detector, can be used with EVERY mod out there including the standard Quake2 setup. It has the ability to notify everyone in the game that a specific user is using a Zbot, and can also kick them out within a predefined time limit set by the Server Admin. Also, the UQSA is making the Z-Bot Detector available to ALL, with no membership or fee required. Product support can be found in the Members Forum on the UQSA website, along with additional information on the UQSA Z-Bot Detector. Mplayer's Quake League, the Mplayer Xtreme League, has been restructured and improved. They are currently offering Divisions in Quake: DeathMatch, Q-Ball, Team Fortress; Quake 2: Deathmatch, CTF; and a Rainbow 6 division within the next couple of weeks (which will be free). Mplayer has recently improved their server infrastructure to get rid of the problems they were having by increasing their servers by 2 fold, restructuring their network, and have plans to quadruple it's capacity in the next couple of months. You can find out more about the new changes and signup info at the MPlayer Xtreme League website. The Oddyssy Interactive Entertainment group is looking for 4 experienced C++ entity programmers to code weapons, enemies, level design entites, vehicles, objects, etc. ; 2 character modelers who have 3D Studio Max 2.0 and Character Studio 2.0 experience; 4 experienced mappers to do the 20th Century based maps, and mappers with texture art experience. For more details on these positions....you can check out the OI Entertainment jobs page. Friday, October 23, 1998 - Submit News! Diamond has released new drivers for the Monster Fusion, along with a custom MiniGL driver for Quake/Quake 2. You can download these from Diamond Multimedia's Monster Fusion Drivers page found here. Indy has finally completed his Left-Handed Configuration Script which is based on the IJKL movement system - the left handed equivalent of ESDF. It has a master.cfg in baseq2, called by all the mod autoexecs, which are DM, RA2, Lithium II, and Q2CTF. He has also provided a very detailed readme which covers everything about the script. I highly recommend that all you lefties out there give it a try...and all you righties will also find some very useful stuff in there as well. You can find this and more of Indy's custom configs at The Bind. If its been a while since you checked out The 3D Palette site, now is the time to head on over there and check out some of their new stuff. The 3D Palette group is dedicated to rendering 2D and 3D art, and specializes in game-related artwork. Thursday, October 22, 1998 - Submit News! Christian Antkow updated his .plan file to announce the release of a public beta-test of the new Q2 v3.20 patch. Here's a direct link to the files he mentions, but his plan also includes the readme file contents so check that out as well. Version 1.1 beta 2 of Action Quake2 has been released. The AQ2 page states it as being mostly a bugfix with only "partial implimentation of what will be in the final 1.1 release." Versions for both Windows and Linux are currently available. Thanks Alpha Connect. The final version (v1.91) of Keys2 has been released. The latest features include Eraser Bot Support and Zbot detection and correction. There's a feature up at Dimension128 by Bill Farmer that talks about steps that can be taken to battle against people who use the Zbot while playing. This article includes specific info including the strengths and weaknesses of the Zbot, and provides tips for competing against them. The United Quake Servers Administration site has opened up, geared towards providing a "private" place for server admins to discuss different issues from the technical-side of things to the user-side of things. They also provide a forum to discuss abusive users and Zbot prevention. Those of you involved in the FragII Quake2 tournament will want to take a look at the revised rules they've posted, including the edition of "Extended Rules" which is a very detailed set of rules for the tourney. PA-Home.com has redesigned and posted a review of Half-Life and Blood2. 3dPalette.com is now part of the Frag.com network, and is specializing in rendering 2D and 3D art. Lights, Camera, Quake2 is a new site looking to host demos from mods like Action Quake2, RA2, Chaos, and Headhunters. Be sure to drop by and submit yours. The Locator has switched gears a little as it is now not just for Clans, Tournaments, Leagues, and Rings. Mod authors can now go and submit their mod for review. Wednesday, October 21, 1998 - Submit News! Our very own QND Software has released an updated beta (beta 2) of Q2ND v1.6. This mod includes their new Funname Name Animation and Standard Name Animation code! The Funname animation uses special characters and thus only works on servers running the Funname standard, however their Standard name animation stuff uses the basic characters but works on all Quake2 servers! Drop by their site and be sure to grab a copy of their software. The Generations team has released version 0.92 of their ultimate id-tribute mod. Currently available in this preview version are the Quake2 and Quake sections, with the Doom2 and Wolfenstein3D sections being prepared for the final release. This update is mainly a bugfix, but keep watching for a Generations map-pack coming sometime this week! Everyone's favorite insta-news-update utility QBS2 has undergone several significant changes, including a new name, now called "Webdog." Along with the name change they've also relocated to their own domain at Webdog.org. Because of the changes, current versions of QBS2 will cease to function sometime during the next week. In order to keep everyone up to date they have released a v0.50 Webdog interim-update to tide everone over until the official Webdog client is released. Version 0.50 is available in both QBS2 upgrade and full-install packages. Version 0.95 of Phaser Frag has been released. This release includes support for all the original CTF maps, new sounds, a simplified scoring system, a new lights-out/flashlight mode, and more. Check their site for the files and for the entire changelog. Version 1.23 of Lithium II and version 1.01 of ZbotCheck have both been released over on the Lithium site. Zbot detection has been improved and some bugs in the high-scores feature have been corrected. John Carmack has been gracious enough to offer a specially-engraved piston from his Ferrari Testarossa as a prize for the Frag II CPL Quake2 tournament. Definitely a prize worth shooting for (ya, pun intended ;). 4th Dimension Interactive has released version 1.0F of their Crush Depth mod. This mod puts you behind the wheel of a submarine, and the update has a couple new features including better multiplayer support, additional player class goodies, and the obligatory bugfixes. Ward Six Entertainment has released some new screenshots of their proprietary 3D game engine called "Renaissance". This engine is still in early development, and no specs are available but they say it will be designed as a hardware-only engine, meaning there will most likely not be any software renderer. Keep checking that site for pictures of the engine after they've integrated it with their world interaction engine! Pels Interactive has updated several things on their site. Among the new additions is the feature site for their new game "Giants". They've got the storyline and some screenshots posted, so be sure to check that out. The Quake2 Bot Emporium has just opened and is preaching all things bot-related.